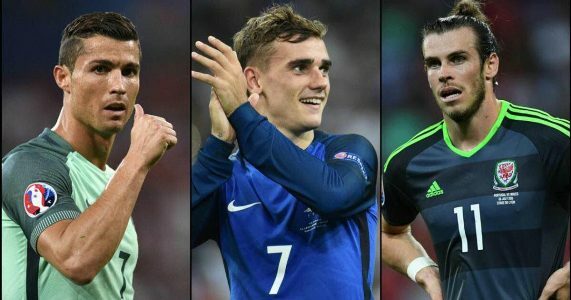 Real Madrid pair Cristiano Ronaldo and Gareth Bale will fight it out with Atletico rival Antoine Griezmann for the Best Player in Europe Award, after UEFA announced the final three on Friday. The award, which is based on a points system, has been whittled down to the last three nominees, with the result to be announced at the Grimaldi Forum in Monaco on 25 August. Journalists from each of UEFA's 55 member associations provided an initial list, with 54 members of the media from across the continent casting their vote. La Liga monopolised the final shortlist after stellar performances during the 2015-16 season for both club and country from the finalists. Ronaldo is favourite to scoop the gong after winning Euro 2016 with Portugal off the back of winning the Champions League for the third time in his career, with Real Madrid.